Reply from the Executive Clerk of Kansas to Herman Buckman in response to Buckman's letter to Governor Arthur Capper regarding U.S. citizenship. The Executive Clerk explains that Buckman should re-file his petition for naturalization despite the fact that relations between Germany and the U.S. are tense as a result of World War I. 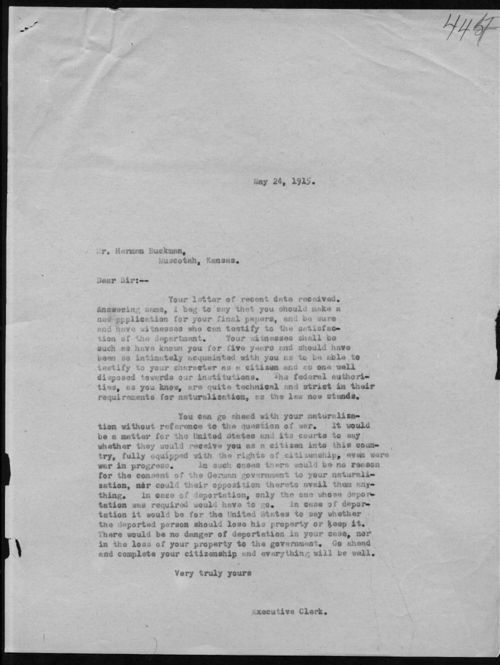 The Executive Clerk's reply can be used in conjunction with Herman Buckman's letter to Governor Capper (#213441) to help students understand the problems German Americans faced in Kansas during World War I, as well as how the state government handled difficult issues relating to German Americans and U.S. citizenship.